Morocco’s legislative elections, that took place a year early following constitutional changes as part of the kingdom’s response to the Arab Spring, resulted in a triumphantvictory for the Islamist Justice and Development Party (PJD). It gained 107 of 395 seats, just over 27%, making it by far the largest party in parliament. As a result, Morocco’s King Mohammad VI appointed the PJD’s leader Abdelillah Benkirane as Morocco’s first Islamist Prime Minister. The PJD victory means that Morocco takes pride of place in the Islamist wave sweeping North Africa in the aftermath of the Arab Spring, with Tunisia, Libya, and Egypt all dominated by Islamist political forces. Islamist governments, until this year, were associated with the autocratic Iran and Sudan. Recently, attention has shifted to the democratic Islamist model offered by Turkey, Tunisia, and Egypt. However, Morocco’s next government, set to be led by its own Islamist party, does not look likely to adhere to either of these paradigms. So what is the PJD and what can be expected from it? From its very beginning the PJD adopted a gradual, conciliatory approach to the Moroccan regime. The party’s origins can be traced back to the 1980s when a section broke away from an Islamist group called ash-Shabiba al-Islamiyya in opposition to its confrontational and revolutionary approach. The breakaway group decided to work within the system and, after renouncing violence, sought to be accepted by the regime. Initially refused recognition, the group was finally given permission to join the Popular Democratic and Constitutional Movement, a small political party led by Abdelkrim Al-Khatib (Mohammad V’s former personal doctor), in 1996. Two years later, the group changed its name to the PJD, and the party that would go on to win the 2011 parliamentary elections was born. The PJD’s cautious approach was cemented through observing experiences in neighbouring Algeria where an attempt by an Islamist party, the Front Islamique du Salut (FIS), to come to power through elections led to a military coup and a decade of bloodshed. To avoid a repeat of this situation in Morocco, the PJD was determined to stick to its gradualist approach. As the party’s former deputy leader, Lahcen Doudi, told me, the Algerian experience taught the PJD the importance of “working step-by-step so that the local and international environment get to know the PJD”. It was determined to prove that it was able to play by the rules set by the regime and sought to ensure that it as not seen as a threat to the Makhzen – Morocco’s loose network of political, business, and military elites. There are several aspects to this gradualist approach. 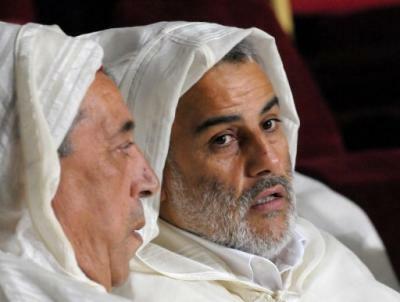 First and foremost, rather than rejecting the existing political system as most Islamist groups do, the PJD was unequivocal in its acceptance of the supreme religious and political status of the king, a necessary condition of working within the system in Morocco. This sets it apart from its main Islamist rival al-adl wal-Ihsan (Justice and Charity), which rejects the king’s status completely and as a result thus been excluded from the political scene. Indeed, the PJD has been so vociferous in its support of the king that Malika Zeghal has referred to its leader, and now prime minister, Abdelillah Benkirane as “a palace Islamist”. The PJD’s explicit and repeated acknowledgment and acceptance of the king’s supreme role makes it extremely unlikely that, once in power, it will radically change the make up of Moroccan politics. The second aspect of the PJD’s gradualism involves its electoral campaigns. Having learned from the Algerian experience, the PJD has sought to gradually increase its presence in parliament rather than seeking to gain as many seats as possible as soon as possible. In that sense, the PJD deliberately limited the number of candidates it put forward in elections so as not to appear a threat. The party that would become the PJD only put up candidates in 43% of seats in 1997 and continued to limit its candidates in the 2002 general and 2003 local elections. This cautious attitude led Michael Willis to describe the PJD as “the party that did not want to win”. This is in direct contrast to the Muslim Brotherhood in Egypt which put up candidates in every available seat in this month’s parliamentary election. Furthermore, the PJD has been willing to accept severe limitations on its actions following interventions by the king. It is said that the party would have won the 2002 elections but it agreed to accept fewer seats than it actually won to appease the palace. Similarly, the party raised few objections to the blatant gerrymandering that took place before the 2007 elections that meant that the party came second in terms of seats despite winning the most votes. Avoiding confrontation with the regime has remained the cornerstone of the PJD’s strategy. In this election the PJD put forward candidates in nearly every district. However, despite its newfound confidence, the PJD’s history of caution means that it is unlikely to do anything once in power that might provoke fierce opposition. Even if the PJD did decide to take on a more radical agenda, it would only have very limited ability to enforce it. Although the position of prime minister was strengthened in September’sconstitutional amendment, the king remains the supreme power in Morocco with an effective veto over any policy and control of the police and military. As such, the PJD-led parliament will have little scope to introduce policy shifts without the blessing of the king. This is especially true as Morocco’s electoral system consistently results in a parliament in which no one party holds an absolute majority. Thus the PJD will be forced into coalition with parties that have close links to the royal palace, such as the conservative Istiqlal party. The impact of the PJD is also dampened by the religious and conservative nature of Moroccan society and politics. In other North African states, such as Tunisia and Algeria, there has been a long-standing state-sponsored secularism, and thus Islamist parties offer entirely different worldviews and political discourses. In this sense, an Islamist-led government could produce a profound political shift even if it only had limited power. This is not the case in Morocco. The king’s status as amir al-mou’mineen (“commander of the faithful”) means that religion already plays an important part in producing political legitimacy, and so Moroccans are used to Islam playing a central role in their country’s political discourse. Nothing unique about the PJD? Even within this conservative society, the PJD tends to have a more socially conservative agenda than its main political rivals. Indeed, the party and its members have sometimes taken actions that have provoked fear among some of the more liberal sections of society. For example, itcampaigned against Elton John performing in Morocco for fears that it would ‘encourage homosexuality’ in the kingdom. However, party deputy secretary general of the party, Abdellah Baha, assured Think Africa Press that the PJD would not outlaw anything based on religion alone but only in accordance with “what’s good for society”. When pushed that surely from the PJD’s standpoint what’s ‘good for society’ will itself be based on Islam, he agreed but stressed that it must be accepted by society and not forced upon people. Indeed, Baha went on to deny that the PJD is a religious party at all and instead made the fine distinction that it is “a political party with a religious reference”. Overall, the PJD’s social conservatism is unlikely to break new ground in an already conservative nation such as Morocco. High profile instances such as the one mentioned above are largely isolated and the PJD-led government is unlikely to change much. One particular fear regularly associated with Islamist parties involves women’s rights. Morocco introduced an imperfect yet much praised family law (Moudawana) reform in 2004, which granted Moroccan women various new rights. Again, this is unlikely to be touched as it was explicitly justified according to Islam and the PJD itself voted for it in parliament. A second aspect that distinguishes the PJD from other Moroccan political parties is its professionalism. Once the PJD entered parliament, it committed itself to the democratic process, building upon its own internal democratic practices. Breaking with tradition in Morocco, the PJD sought to take its parliamentary role seriously, showing impressive party discipline and commitment. The PJD has almost no defections – defections to the ruling party are commonplace in Morocco – attended more sessions of parliament and asked more questions than any other party. Furthermore, as researcher Eva Wegner has observed “each deputy is required to draft at least one oral question per week, one written question per month, and to propose one bill per legislative year”. This bodes well for a Moroccan parliament rarely associated with such professionalism. An analysis of the nature and history of the Moroccan system and the PJD makes it very unlikely that a government led by the PJD will lead to any noticeable differences in Moroccan politics; the king will still have hold of the central political and religious role and Morocco will steer a path between the conventional democratic and theocratic Islamist models. The PJD will remain a democratic Islamist party that supports the authoritarian rule of the king. However, some maintain that the PJD’s accommodating stance was merely a ruse to come to power and that its true intentions will now be revealed. The PJD is a broad organisation, and there are certainly members such as Mustapha Ramid who have taken more confrontational stances. Add to this a rank and file that often appears more radical than the leadership and there is a possibility that the party will take more aggressive positions. But this remains unlikely, especially with Benkirane at the helm. This entry was posted in Uncategorized by James Asfa. Bookmark the permalink. When there’s blood on the streets … buy stun-guns.